Michael Vaughan's advice to Graeme Swann: "Smile! Have a bit of fun and that will buy you to week five - then you will actually have to dance!" The evenings are getting darker, the kids are back at school and there are increasing numbers of chunky-knit cardigans appearing on the high street. All this can only mean one thing... Strictly Come Dancing is almost upon us. The 16th series of the nation's favourite dancing competition starts on Saturday with a new line-up of celebrities ready to don the sequins between now and December. 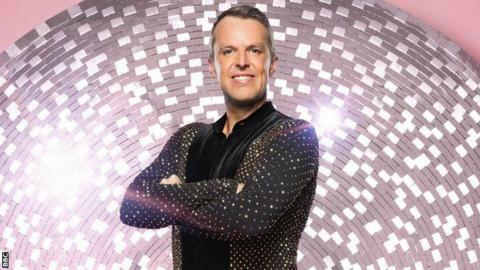 Ex-England spinner Graeme Swann is the latest in a long line of plucky sports stars ready to shuffle and shimmy around the dance floor and former Strictly contestant and fellow Test Match Special commentator Phil Tufnell has some advice for Swanny's big moment. "Never double dip on the spray tan and the more rhinestones the better!" But as far as actual dancing goes, could Swann's international cricketing pedigree be his strength before he has even learned a step? Do cricketers make good dancers? Cricket has already provided two Strictly winners - Darren Gough and Mark Ramprakash. But, interestingly, McFly drummer Harry Judd and former BBC Breakfast presenter Chris Hollins - both Glitter Ball trophy winners - are also accomplished cricketers. Hollins played first-class cricket at Oxford University gaining a blue, while Judd was a talented batsman in his school days, making him first on the billing at many a celebrity cricket match. So is there a correlation between cricket and fancy footwork? Strictly professional dancer and choreographer Neil Jones thinks hand-eye co-ordination may have something to do with it. "Cricketers have a great awareness of others around them - which may help them with following what their partner is doing," he says. "In general there are three things that make a good dancer. "One is having good co-ordination, and athletes are usually great at that. But the two other areas they sometimes struggle with - those are rhythm and being able to let go and perform." Cricket experts often talk about the 'rhythm of the game', but what do they mean? West Indies director of cricket Richard Pybus has written about this very topic for his coaching website CricketLab. "Rhythm is a natural flow of skills coming together through each of the stages of bowling," he says. "Each part needs to flow into the next - if one piece isn't working it cascades through and impacts on the next." Tuffers - who reached a very respectable week nine of series seven - makes the same observation when talking about dancing. "Sometimes you got things that felt very natural to you. But sometimes you would get your timing off and there is no way back from that!" We also asked former England captain Michael Vaughan - series 10 alumnus - whether it was possible for cricketers to transfer their instinctive motor skills to the dance floor. "Rhythm (in a cricket context) is something you've trained your brain to do for many years, and then you get thrown into Strictly - clearly my brain wasn't training for that sort of rhythm!" So how does this explain why two cricketers have won Strictly? "Goughy had great rhythm but Ramps was just an outstanding dancer!" says Vaughan. "I think when you are tall and quite thin, the elegance of the ballroom dances looks better - I was very good when I was 'in hold'. But in the Latin dances, when you were out on your own, it's the most frightening moment!" Tuffers agrees wholeheartedly with Vaughan on this matter. "Out there on your own, if you get something wrong you are in a world of pain!" he laughs. Do the pro dancers WANT to be paired with an athlete? Strictly pro Neil Jones says there are obvious advantages to being paired with a sports star, but it has its downsides too. "It's in an athlete's nature to train to win - but having such resolute focus in dancing, that isn't always a strength. "Dancers have to train their facial expressions to hide how much they are concentrating, but often an athlete's unmistakable focus is written all over their face." Vaughan believes having an athlete's mentality can help Swann go far in the competition. "Sportsmen have the discipline to arrive at training on time and set a target of the 'game or match' on a Saturday, so I think that's why athletes get used to it quite quickly." How do the other sports fare? Cricketers aren't the only sports stars to waltz their way through to the later rounds of the contest. "Gymnasts obviously do really well as they have the flexibility and can do amazing tricks that make a performance look impressive," says Jones. Olympic gymnasts Louis Smith and Claudia Fragapane both took part, with the former taking home the trophy in 2012 and the latter making it to the semi-final. "Boxers sometimes have great rhythm and fast feet but often have the opposite posture for ballroom and Latin dancing," Jones continues. Champion fighters Joe Calzaghe, Audley Harrison and Anthony Ogogo have taken part in the show - all with average scores of 23 or under. There have, however, been some successful rugby players in previous series, with former England stars Matt Dawson and Austin Healy both managing to grab the runners-up spot. Healey boasts the highest average score of any athlete to ever partake - 34.5 out of 40. And the lowest, we hear you ask? Golf's Tony Jacklin with a score of 14 in his only competitive dance. That's Swanny's target then - his former England colleague Michael Vaughan has some advice for him. "Have a bit of fun and that will buy you to week five - then you will have to actually learn to dance!" Where is Yaya Toure going next? Spag bol, chicken tacos and... avocado mousse. What fuels World Cup stars? Read more on What food do World Cup stars Kevin de Bruyne and Kyle Walker eat?